William Henry Spackman wrote the first angling book to be both written and published in New Zealand. It was called Trout Fishing in New Zealand: Where to Go and How to Catch Them, published in 1892. Spackman was the joint owner of a fishing hut at Selwyn Huts. The picture above is of Spackman Avenue. The Selwyn River is to the right of the picture just over the stopbank. George Ferris once described the Selwyn, in its hey-day, as being looked on as the best brown trout river in the Dominion. Though this exalted status is no longer fitting, Canterbury ‘s Selwyn River nevertheless still yields many a good fish, with brown trout weighing up to nine pounds or more not uncommon. I have been told many stories by older anglers of the countless evenings – and whole nights – they spent fishing the lower Selwyn. A good number of Canterbury anglers would descend upon the lower reaches on a Friday night after work and would not cease fishing, in many cases, until the sun began to rise on Saturday morning! Such was the allure and productivity of this water. Many built holiday batches (or cribs) at Selwyn Huts and Lower Selwyn Huts in order that a degree of comfort might accompany their fishing. Prior to about 1930, the entire 90-kilometre length of the Selwyn River flowed above ground. Nowadays, a 30 kilometre stretch, between Coalgate and Boyles Ford, flows below ground only, over the summer months. The reduction of above ground flow to nil during the greater part of the year results from the terrain below Coalgate being more porous. This condition continues until a few kilometres above Chamberlains Ford (Chamberlains Lure) where the river resumes its normal flow. This drying up of the Selwyn below Coalgate has, as you might imagine, not helped the fishery. Fish salvage operations were frequently carried out in the pools left high-and-dry, though many trout from fingerlings to mature fish are lost each year. Lower Selwyn River Trout Fishing Access MAP. 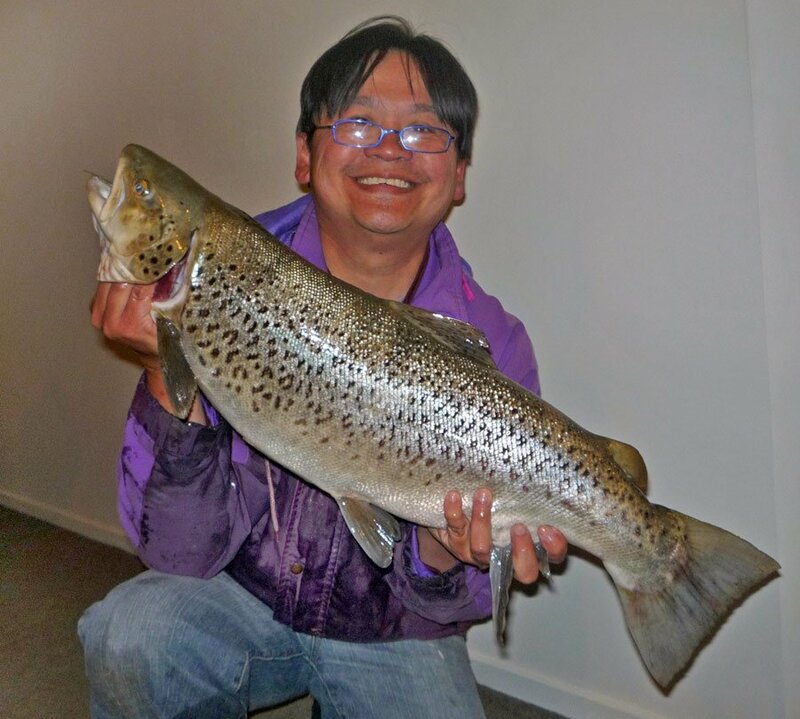 Mark Ho with a huge sea-run brown trout he caught from the Selwyn River on 8 November 2012. It tipped the scales at 10 pounds. Mark caught it just on dark with a black and gold Toby. Click on picture to enlarge. Some of the anglers who fished the Selwyn mouth during the 20s and 30s developed their own lure patterns. The best known of these “Canterbury Lures” is the Hope’s Silvery. David Hope was, in the late 1920s, curator of the North Canterbury Acclimatisation Society (now the North Canterbury Fish and Game Council). Hope studied the life history of inanga (whitebait) and the role of whitebait as a trout food. This work no doubt providing him with many good ideas for his trout flies, which were in effect whitebait or silvery imitations. His Hope’s series of flies are still extremely popular today and are sold by all the leading Canterbury fishing tackle stores. The same lures used so successfully on the big trout of the Selwyn River and Lake Ellesmere are used with equal success on nearby Rakaia River sea-run brown trout. Other anglers around this time also developed their own lures. The patterns they came up with are still fished in Canterbury. In fact, many successful Canterbury lures are now used to good effect throughout the country. Other Canterbury lure patterns include Red Shadow, Harts Creek (named after the small stream of that name which also enters Lake Ellesmere ), Yellow Terror, Red Terror, Brunton, Christie, Wooster’s Silvery, and others. Most of these Canterbury patterns are relatively bulky affairs often made with wider hen feathers. Perhaps this was in­tended to give the Selwyn River brownies every chance of seeing them should the water be at all discoloured. Fishing for trout with live bullies has long been a popular and successful method in the relatively slowing moving water of the Selwyn’s lower reaches. I know many frown upon bait fishing but it is a perfectly legitimate means of fishing. The stomachs of trout caught in the Selwyn, and Lake Ellesmere, are often found to contain large numbers of bullies and silveries. So these small fish obviously form an important part of the trout’s diet. The deep, slow-moving, murky water in the lower Selwyn is ideally suited to bully fishing. The usual method is to lip-hook the bully and cast it out up­stream to drift along with the current. No float is needed unless fishing with spinning gear. The idea is to use no weight, or as little as possible, to allow the bully to be presented naturally to the trout. After the bully has drifted down and into the bank, it is retrieved and the upstream cast repeated. As stated, there can be big fish in the Selwyn; some of the sea-run browns can reach double figures. This makes extremely light tackle inadvis­able. Should a big fish head down­stream thick willows and other bank vegetation make following it an impossibility? Many regard the Selwyn mouth as fishing best at night. Under cover of darkness, brownies move from Lake Ellesmere and enter the Selwyn chasing bullies and silveries. Easy access to the banks of the Selwyn adds to the ease of fishing there at night. In many places, you can park your car and climb just a few metres over the stopbank to be fishing a good spot. Only a few miles upstream are Coe’s Ford and Chamberlain’s Ford. These have been favoured picnic spots for day trippers and anglers alike. They were perhaps the best fishing stretches of the river during its heydey. All methods are appropriate here including dry fly, wet fly and lures (streamers). My choice of spinning hardware would be a small black and orange ticer or black and gold Toby. Veltics and Mepps are also popular. Their spinning blades creating more life when fished in the slow-moving brackish water near the mouth. Lake Ellesmere, like its nearby neighbour Lake Forsyth, is periodically opened to the sea when flooding of bordering farmland becomes a problem. On several occasions in recent years, such flooding has turned the area around the Lower Selwyn Huts into a miniature ” Venice of the South,” albeit perhaps with not quite so picturesque results. A boat can, on such occasions, be a handy asset for checking the mailbox! “The last three miles of the Selwyn River, in Canterbury, are very deep, and with scarcely any current, just enough to keep the bait moving, and this is the favourite haunt of the all-night angler. Up till last year, probably not less than a tonne weight of trout was annually taken out of these last three miles of water, the supply of fish being constantly kept up from Lake Ellesmere.” The previous paragraph is an excerpt from Trout Fishing in New Zealand – Where to go and how to catch them – by W.H. Spackman, published in 1892. Mr William Spackman was writing about night fishing in the lower Selwyn River in the years around 1890-1891. The fishing method under discussion being live-baiting with lip-hooked bullies and smelt. Give the lower reaches of the Selwyn River a try. There are still some very big brown trout lurking there. You can also experience the chance to relive a little of Canterbury ‘s early angling history! See also Night Fishing the Rivers that Flow into Lake Ellesmere with Keith Chin.